Institutional intervention from state and state-funded nonprofit organizations rose dramatically when Nestor Kirchner was elected in 2003, winning on a platform of governmental accountability and transparency; the promotion of human rights was central to these efforts. These human rights efforts have not focused exclusively on addressing abuses of individuals’ human rights, but also on repairing the damage done to community ties and social cohesion caused by a climate of fear and insecurity. In particular, the government has sought to shape collective cultural identity and social cohesion by increasing funding to community-based organizations that promote every citizen’s right to “freely to participate in the cultural life of the community” (Universal Declaration of Human Rights, United Nations, 1948). Within this context, my ethnographic research has focused on one particular site of intervention, La Casa de la Juventud, to examine how the dominant discourse of human rights is implemented on a day-to-day basis, and how multiple forms of agency are invoked and employed in the dialogic encounters that work to shape the individual narratives of young participants. I chose La Casa de la Juventud as my primary field site because of its strong dependency on federal funding and its wide range of services. La Casa is situated in the suburbs of Buenos Aires, within Morón, a municipality recognized for its progressive politics and active civil society. While the work that these sites have been performing over the past decade has been important for the most marginalized, this past November demonstrated that these values are not priorities for all Argentines. The political climate in Argentina has become increasingly polarized over the past few years and there has been a rising level of animosity between those who support the former administration asistencialista and those who are against it. While many supporters of the Kirchner government have recognized that the recuperation of the country will be a long process, many Argentines have become impatient with restrictive economic policies and the high level of government investment in social programming. This November, Mauricio Macri, the former governor of Buenos Aires, was elected president. Macri famously promised in April 2014 that “conmigo se termina el curro de los derechos humanos.” This has caused great concern for many human rights activists, who understand that in order for human rights to be achieved, human rights laws must be enacted. Many have fears that these recent political changes will cause greater social stratification and community dissolution, as in the time of the dictatorship. In Morón, there was a great uproar when the graffiti “el 22 se termina el curro” [22 being a reference to the date of the elections] appeared on the walls of La Casa de la Memoria, a former clandestine detention center. However, human rights activists are working to remain hopeful, to use this difficult moment as an opportunity to strengthen alliances between community partners, and to resist the conservative policies of the new government. 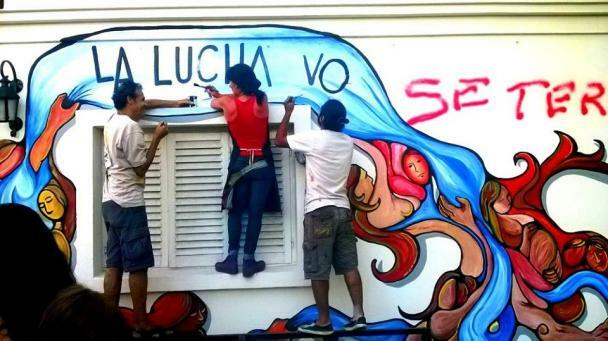 The community responded to this act of desecration of the Casa de la Memoria by creating a new mural on the wall, inviting some of the abuelas de la plaza de mayo to assist in its construction. One of the directing artists, Matias de Brasi, shared that he viewed this act as a “re-simbolización de ese sitio que desde el año 2001 se venía dando… No fueron unos murales más. Los mismos fueron pintados con la participación de cientos de vecinos que producto de esa re-simbolización sienten el lugar como propio. Las fotos de la casa antes… me niego a nombrar como un simple hecho de ‘vandalismo’. La carga simbólica de este hecho es mucho más triste y preocupante.” Many of us are worried about the changes to come in Argentina. My primary field site for my master’s research, La Casa de la Juventud, has already been closed. Yet I will return to Argentina and I hope to help understand the shape of the shifting political tides. La lucha no se termina.